If, as Merriam et al. (2007) write, "how postmodernism can play a major role in adult education is only recently being articulated," where could I look for evidence of its articulation (p. 260)? As a new full-time educator at Ivy Tech Community College of Indiana with closer access to faculty and a deeper understanding of teaching rationale, I wanted to know how postmodern theory was reflected (consciously or subconsciously) within community college program designs. I wanted to look at this population of adult learners because postmodern theory assumes repressed voices have value and should be lifted up, not silenced; heterogeneity (in socioeconomic status, in ability, in age, etc.) 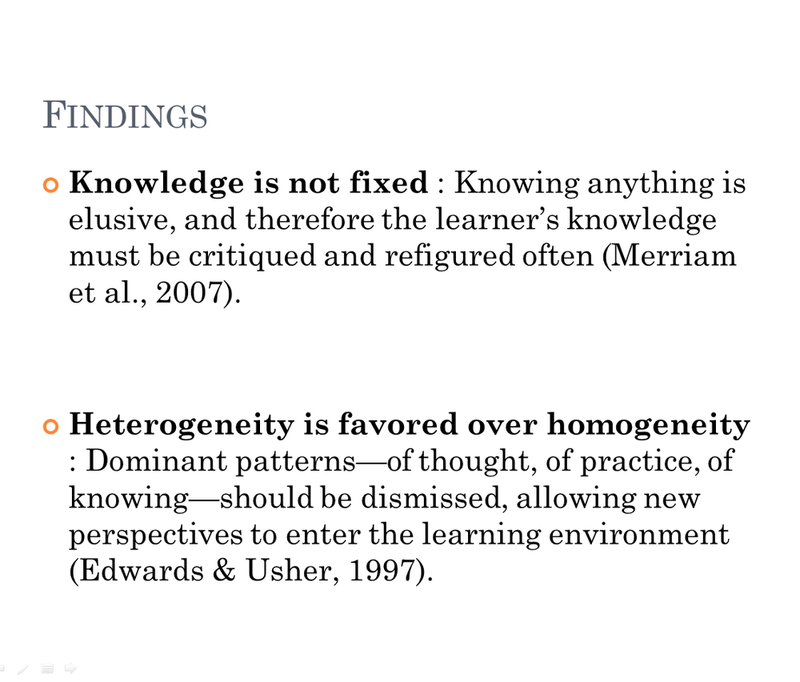 is favored over homogeneity; understanding one's social identity and oneself is favored over the production of material wealth; skepticism and critical questioning are paramount; and multiple ways of knowing have value because knowledge is not fixed--diversity has real worth (Nguyen, 2010). The community college environment, with its truly diverse student body, seemed ripe for program designs that combined many of these features, and indeed I found two: the Associate Accelerated Program (ASAP), and the Accelerated Learning Program (ALP). Studying these two programs, I designed a program that in many ways combined their positive attributes and built on their foundations. The sections below outline findings from the literature, applications of that literature, evaluations from outside voices, and implications for postmodern theory. The video below contains a lecture by Daniel Bonevac and will introduce you to postmodern thought. After highlighting these features of postmodernism within adult education (a full discussion can be found by clicking here), I focused on two programs sweeping through community colleges today. These programs and the application of these programs toward my program design can be seen below. I decided to create a program that combined the degree focus of ASAP with the support for developmental writing students found in ALP. 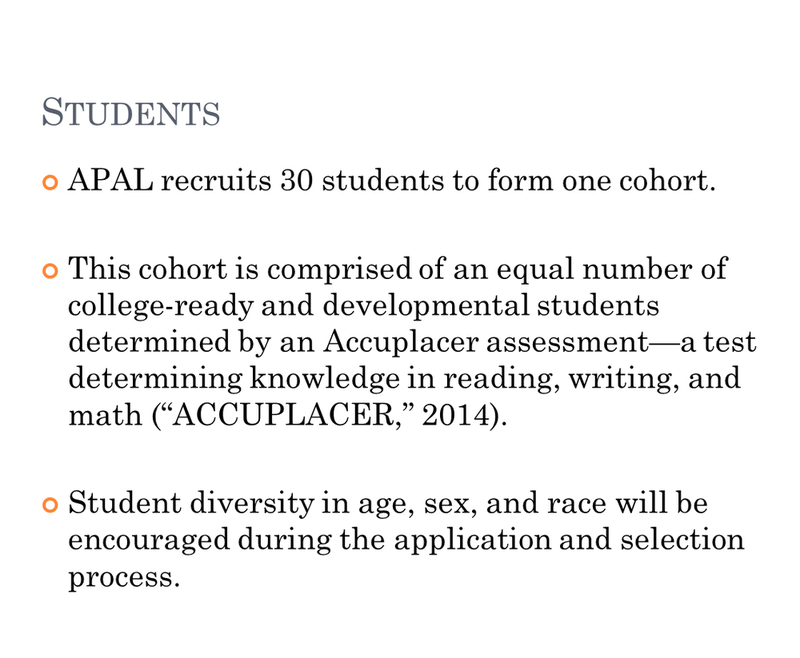 The Accelerated Program for All Learners (APAL) allows an equal number of "college-ready" and "developmental" writers and learners to complete an Associate's degree in General Studies (a full discussion can be found here). After drafting this program, it was reviewed by two educators within the community college system: Carol Simmons, English department director at Ivy Tech CC - Bloomington, and Patrick Harned, an English Instructor and tutor teaching within the St. Louis, MO and western Illinois community college system. Further comments were provided by peers within EDAC 643 and professor, Dr. Bo Chang. They identified strengths and weaknesses, allowing for revision. A full discussion of the evaluation can be found here. This study of postmodern theory within adult and higher education could lead to the modification of existing accelerated programs or the creation of a program similar to APAL, one that notably includes the most disadvantaged group of students--those needing some form of remediation. While APAL does not consider mathematics remediation, it could grow in scope with the help of mathematics educators currently leading accelerated programs. Finally, the research and program design accomplished this semester will add to the support for accelerated programs within the two-year college system, highlighting the ways in which postmodern theory's goal to challenge dominant hierarchies (such as the two-year Associate's track model) can be successfully disruptive--a paradox that postmodern theory embraces. Message: Good job on you project demonstration. I really enjoyed reading about you topic of postmodernism throughout the semester. I think you continued to do a good job relating it to the community college which is partially why I was so interested. I also like the format you did for the demonstration. I'm glad you said to keep clicking the images or I would not have known to! Message: Great Job ! Nicely organize presentation. It was nice reading about the different accelerated programs. I am really impressed with your webpage and utilization of it! You did a great job, I am wondering if you have a background working with digital formatting or something.. Thank you for the tips and introduction voice recording. At first I missed it, because it kind of blends in, but once I found it it really helped and made sense of the page layout. It is very interesting and great that you put so much into creating this program, I am sure Ivy Tech is proud of you! You did a great job and provided many details. I especially enjoyed your layout of the program demonstration. Best of luck at the conference! You will do great! Message: I like how you blended the two programs together to create one dynamic program. I am familiar with the ASAP program offered at Ivy Tech and have met with students participating. It seems like a great way to accelerate your education, as long as the students are prepared for the intensity of work that is involved. Message: It was interested to read more info about the ASAP program, as I have heard of it and met students participating in the program when they came for a campus visit. This is a quite unique way of presenting your project in a website. The page layout is great, and it is very helpful for your readers to see the sequence of your project. Are these the PowerPoint formats which were embedded in your website? I like that you added the links of your assignments, which is convenient for your readers to know more detailed information about your project. I like the video you posted too! It helped your readers to know more about postmodernism. 1. It will be very helpful for the readers who have no much background knowledge about the topic of postmodern if you can create a table to lay out the principles of postmodern and how you applied these principles in your program. You have mentioned about application in your program investigation table, and you also discussed about the rationales of how to create your program. In this table you will create, specifically list the principles you will apply, and actions you will take and strategies/methods/tools you will use to design your program based on each principle. For example, one of the principles is: Knowledge is not fixed, and learners' knowledge must be critiqued and refigured often. Based on this principle, tell us the objectives you will achieve in your program, and how you will achieve these objectives based on the principle that knowledge is not fixed, what kind of activities you will organize to reflect this principle. 2. Add the links of additional resources such as readings and websites which relate to the topic of postmodern.